SECRET SAUCE: I have an exciting update to share. We solved our dining table problem! This was a design journey, so let’s start at the beginning. Design is a process and when I started planning our first floor, I was set on creating a living room/dining room combo similar to my old apartment. Below is my mock-up and clearly a LOT of things have changed since this first layout plan (for starters, our couch placement also ended up differently and there is no TV, but I will save those topics for another post). Jeff and I were both very happy with the above layout initially and in theory. But, we both decided to live in the apartment for about a month before making any furniture decisions. I knew that a dining table would technically fit and decided to test is out how a full size dining table would work in the space by putting out a six foot folding table that we had at Jeff’s place for entertaining. We didn’t have a day-to-day dining table when we were living at Jeff’s and it was something that I really wanted in our new place. I wanted this to work so badly! But, in the end I am glad that we tried this out in real life because the size of a table like this just didn’t work in the space. In addition to cutting off the kitchen, it also really limited the occasional chairs that we would be able to use across from the couch, which ended up in front of our windows. This table size was too big and so it was time to try something else. On to the next idea. My primary goal here was not to have to eat on the couch. Having a place where Jeff and I could sit down and eat our meals was really important to me and I was not willing to give up on this idea! Since a big table took up too much space and cut off the kitchen, my next idea was to create a dining nook between the end of our kitchen cabinets and the fireplace. This idea was a step in the right direction and I started playing around with product options and created a mood board for the dining nook. I liked the idea of high contrast and fell IN LOVE with these chairs from Pottery Barn. I tried pairing the Pottery Barn bistro chairs with a black tulip table from Wayfair. And also this lighter option, also from Wayfair. While I really loved this design, it turned out that Jeff isn’t a big fan of round tables and this also layout limited out options for chairs opposite the couch. If we had gone with this layout, one of our occasional chairs would have had to be in front of the fireplace (not ideal). At this point, I had put in over a dozen hours of research and work into this process and I was very frustrated. I’m human! We just moved into what feels like a big apartment and yet I can’t find place for two people to sit across from each other and have dinner? What is the solution? Then it hit me. And the solution had been in front of my face the entire time. A counter table! This would solve two problems for us. The layout of our kitchen is a little awkward and while it is big, we needed more prep space close to the stove. A counter table would allow us to have a dining table AND extra counter space. Win win. There was also an added bonus of making the living room more spacious. We decided to only consider backless stools, so that they could be completely stored under the counter table when we weren’t using it. A quick note on counter tables from everything that I have read: They are typically 34” - 36” high. If you are buying something that you want to have double as a work surface, be sure to measure the height of your kitchen counters, so that the table is roughly the same height. 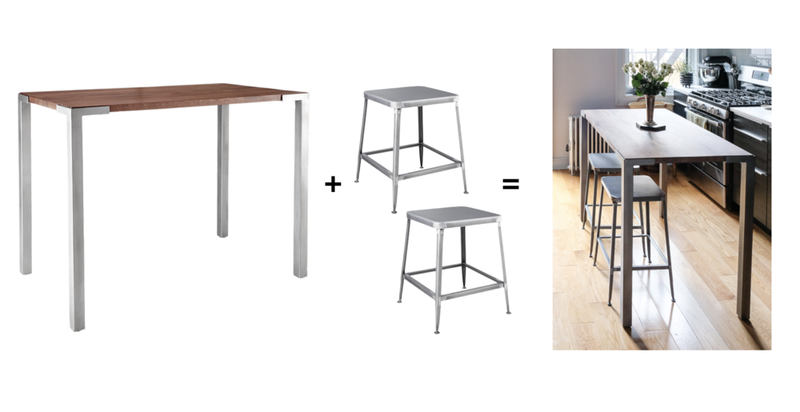 Also, a counter stool should be roughly 24” - 26” high. Don’t make the mistake of buying a 30” bar stool for a standard kitchen counter - those few inches make a HUGE difference. Jeff and I decided that we didn’t want to spend more than $500. I initially liked the idea of a marble top, but we wanted this area to do a lot of cooking prep work and were worried that porous marble would be too high maintenance. 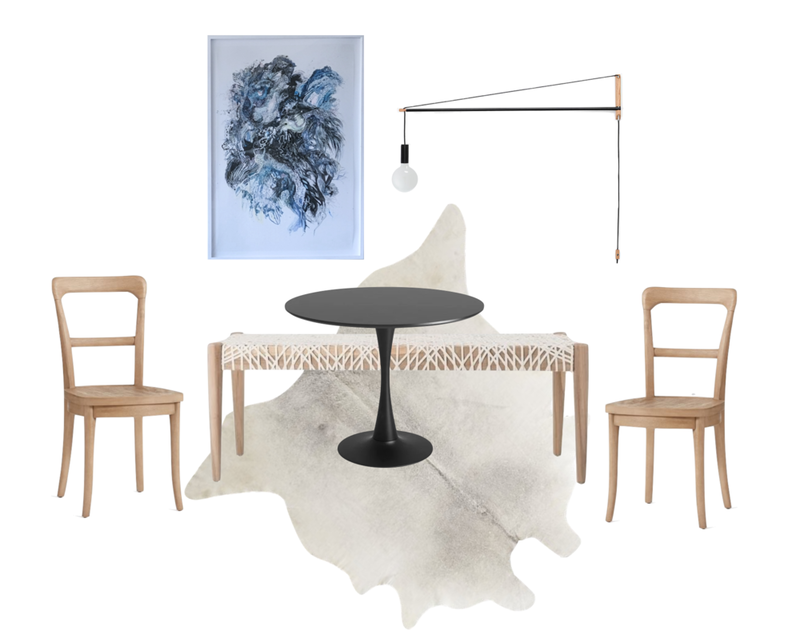 I always love tables with mixed materials and was drawn to this counter table from CB2. 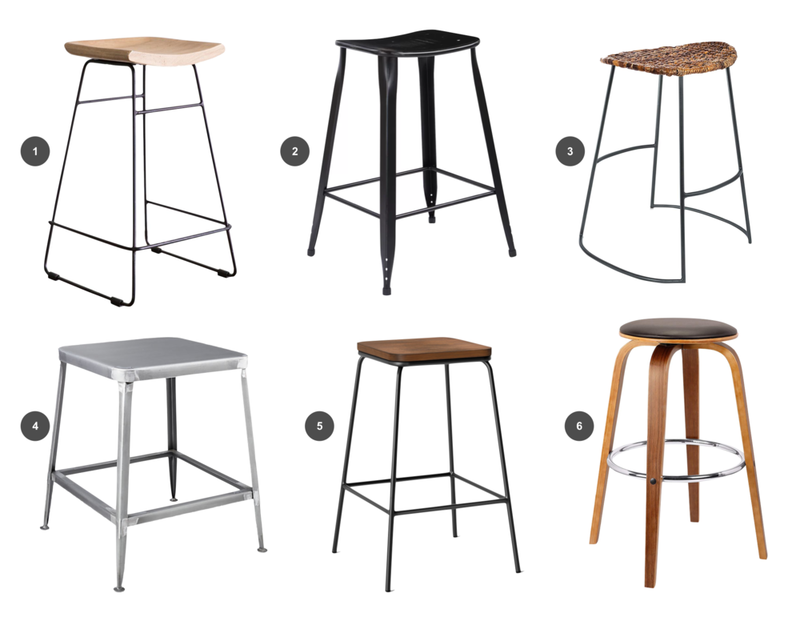 We paired it with these metal stools, also from CB2 and by taking advantage of a Black Friday deal everything together was within our budget. Here is the result and we could not be happier with the table. The stools are comfortable and the table has been a dream to eat at and use for cooking prep work. How do you feel about counter tables? What do you think of our decision process and where we ended up with our table? I want to hear your thoughts in the comments below!